Many traditional healing systems have some kind of medicine wheel teaching, which relates the life and health of the individual to the universal life forces and cycles of the natural world. Greek Medicine also has a medicine wheel, through which its most basic and fundamental correspondences may be known. 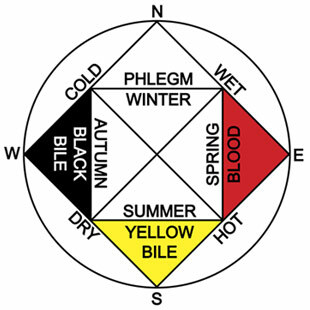 The Greek Medicine Wheel starts in Winter, whose Cold, Wet weather produces excessive Phlegm, causing, colds, coughs and lung congestion. In Spring, the weather gets moderately Hot, or Warm, but still remains Wet, or Moist. Sap, the lifeblood of the trees, rises up to the leaves and branches; in our bodies, Blood also gets lively and exuberant, and rises to the surface. In Summer, the increasing heat evaporates the remaining moisture, making the weather Hot and Dry. The hot, dry conditions aggravate Yellow Bile, making us feverish and irritable. In Fall, the weather cools off but the dryness remains, making Fall Cold and Dry. These climactic concitions aggravate Black Bile, which has similar qualities. Then, increasing Cold as Fall moves back into Winter condenses the atmospheric moisture, making Winter again Cold and Wet. The wheel has come full circle. The waxing and waning light and heat of the 24 hour daily circadian cycle mimicks the seasonal changes of the year. And so, each quarter of the circadian cycle corresponds to a certain season of the year, with similar associations of humor and temperament. Winter corresponds to Midnight of the circadian cycle. And so, the six hour period surrounding midnight, from 9:00 PM to 3:00 AM, is Cold, Wet, and Phlegmatic in temperament. Spring corresponds to Sunrise of the circadian cycle. And so, the six hour period surrounding sunrise, from 3:00 AM to 9:00 AM, is Warm, Moist and Sanguine in temperament. Summer corresponds to Noon of the circadian cycle. And so, the six hour period surrounding noon, from 9:00 AM to 3:00 PM, is Hot, Dry and Choleric in temperament. Fall corresponds to Sunset of the circadian cycle. And so, the six hour period surrounding sunset, from 3:00 PM to 9:00 PM, is Cold, Dry, and Melancholic in temperament. Poetic or metaphoric analogies can be drawn between the seasons of the year and the stages of life, which have corresponding affinities of humor and temperament. Spring corresponds to Youth. Youthful bodies are Warm and Moist, are full of good, exuberant blood, and are constantly growing. Summer corresponds to Adulthood. These are the peak, full throttle years of life's zenith, with lots of Choleric drive and ambition. Fall corresponds to Maturity, or Middle Age. The light and heat of the sun have begun to wane, and so has the Life Force within us. A Melancholy, philosophical realization of the transitoriness of life dawns. Winter corresponds to Old Age which is Cold, Wet and Phlegmatic in temperament. The light and heat of the sun are at their lowest ebb, and so is the Life Force in our bodies. Finally, all light and life are extinguished. Then, some say that this cycle also repeats with the youthful rebirth of a new Spring.